I finally dynoed my Dinan s3-r while at the track today. We also did a dyno on a stock 2013 e92 m3 immediately afterwards to act as a baseline. Both cars on 91 octane. I still have plans to bring the S3-R to Mike Benvo at BPM to protune it. Last edited by ilikebmxbikes; 02-17-2015 at 01:22 PM. That's so nice, so smooth. It actually look similar to graphs of before/after supercharging. Can't wait to see what Mike@BPM can do to it! That's some pretty awesome gains. 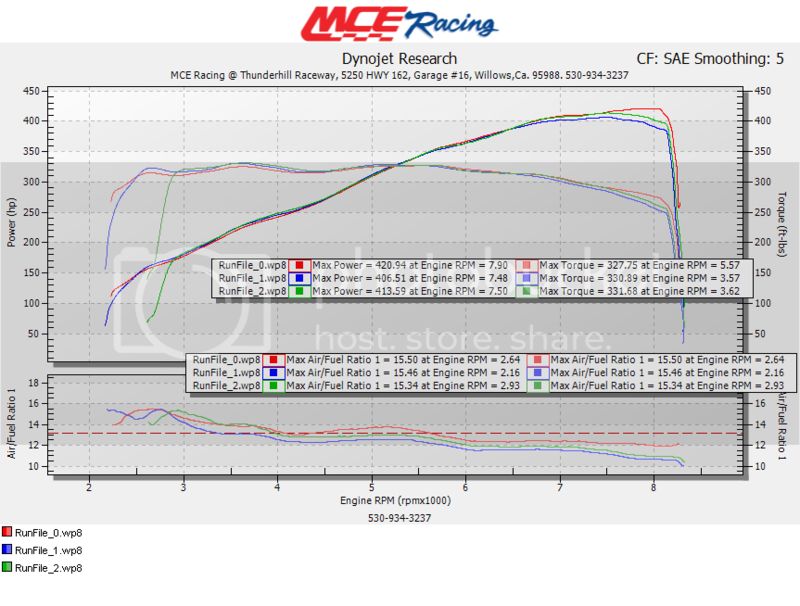 At first I thought it was the dyno jet reading high so I didn't pay much attention to the numbers, but then I realized the stock m3 reading was pretty low. Curious to hear your thoughts on the difference on track? Any Lap time changes, section/ corner speed data from when it was stock? DCT. Custom Cantrell MS cage. Fire, SCCA, dedicated track. Diffs-online 3.62, diff cooler, MCS 2-ways, SPL arms, TMS solid SF/Diff bushings, RD sway, DO88 Coolers (DCT, RAD, PS, OIL) Akra catless GT4, BPM tune, Hans Recaro, ST60/40, Cobalt XR2/4 race pads, BBS E88's, Apex ARC 8's, Yoko A005 slicks, RKP GT4 Splitter, GT4 canards, APR GT250 Wing, CFK Hood, Flossman CFK fenders, BW carbon doors, BW race CAB's, Dinan R toe links, Mini battery. thanks for sharing! What a N/A Beast! I cant wait to see what Mike can add to the car. I also need him to code some of the features he added to my 1series. The dinan stroker is a beast. It is significantly more powerful than my FBO s65 in my 1 series. Despite that, after seeing some dynos online i really didnt expect it to put this much power down. A few people have driven it who have more experience in a stock / fbo m3's and they always comment on the torque and how much quicker it pulls out of turns. My 1series is ~400lbs lighter than the s3-r and despite both having s65's feel completely different. We did do some highway pulls on the way home from the track and the Dinan s3-r was pretty neck and neck with a FBO E60 M5. Thats Sic. Torque curve is really nice! Wow, very nice gain compared to the stock S65, what a dream engine you have there my friend!! These are really amazing results. Engine work is definitely in my future someday. the car being stock dyno at only 325 whp? Amazing graphs. are those air fuel numbers really 15+? Depending on the dyno. 330-350 whp is about the average that I've seen. Depending on when they did the runs (before or after the track day), the car might have already been pretty hot and pulled timing a little. But if so, that was presumably affecting both cars. The dyno was reading a bit low. It is running a little lean down low. We dyno'd after lunch. The cars were idol for about an hour and a half to two hours. Stroker was dyno'd first, then the stock e92. That's an amazing delta against the other M3. Can you get a dyno also at Alexshop? They have a number of stroker dyno's including a Dinan motor that only made paltry gains. This is an opportunity to see how yours compares, which I'm sure will be much better. Cheers. Wow. I'd love that power on track. Same wheel/tire combo on both stroker and stock? Light weight wheels on Hoosiers will show higher numbers. Alekshop is local to me. I dont know where aleks dyno's his cars but would be willing to take the trip down if he wanted to. Seeing his GTS clone in person again would be worth a trip to the dyno. The stock e92 baseline is very similar to his baseline on the stock e92 in his comparison. They are both awesome cars and probably quite similar in power. I am more curious to how Benvo can further tune this car above the Dinan tune. Stroker had HRE R43 18X11 ET22 w/ 275/35/18 R888 and the stock car had 19" OEM Competition wheels and tires. Last edited by ilikebmxbikes; 02-17-2015 at 01:37 PM. Every dyno will make different numbers depending on the manufacturer and the settings the user has set on it. 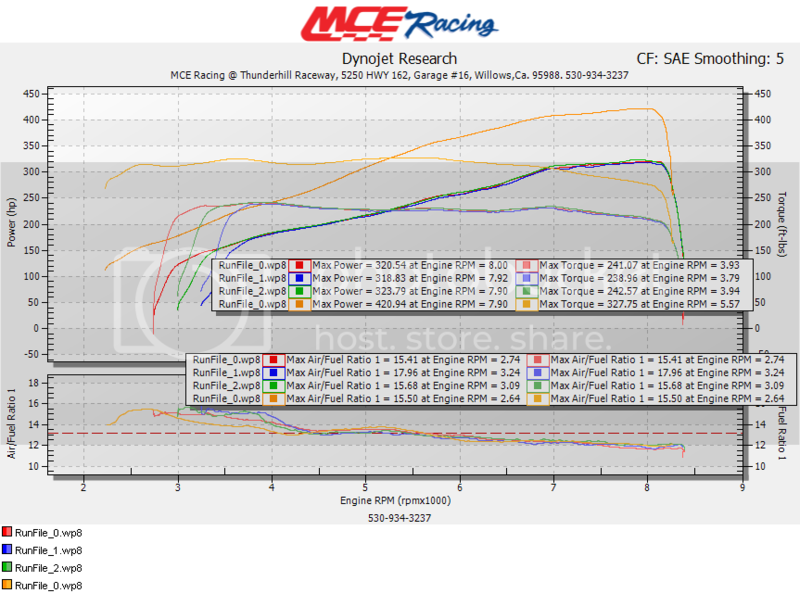 Dynojets tend to read a bit higher than others like Mustang dynos. 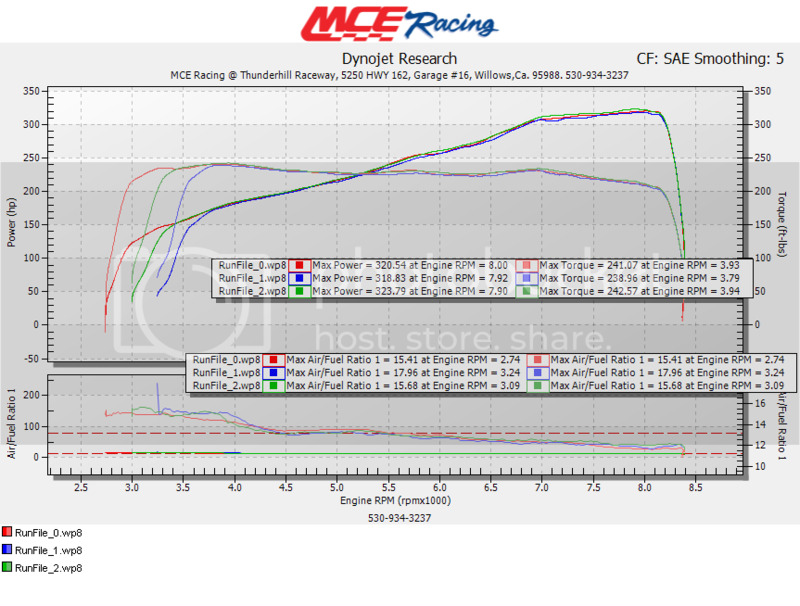 The Dynojet is an inertial dyno, not dynamic load bearing like the Mustang. To compare horsepower between cars, the cars needs to be run on the same dyno in the same location. In this case, it looks like the S3-R has some great gains over stock! Wow, I'd love an e90 with that motor.